We know practically nothing about Claudius Ptolemy or his life. Among other things he was an ancient astronomer, astrologer, mathematician and geographer living in Alexandria, Egypt which was then part of the Roman Empire. He wrote on a diverse range of topics including geography, optics and music. He is best known for two books. One of them is ‘The Almagest” which is an astronomical treatise and contains star catalogues which are still in use to this day. It was the authoritative work on the universe for many centuries. Ptolemy also wrote a companion piece on astrology called the ‘Tetrabiblos” (the four books) which remians one of the most important astrological texts for all students of traditional astrology. Peter Apian. “Cosmographia.” (1539) Diagram showing the Ptolemiac Universe of crystalline spheres. 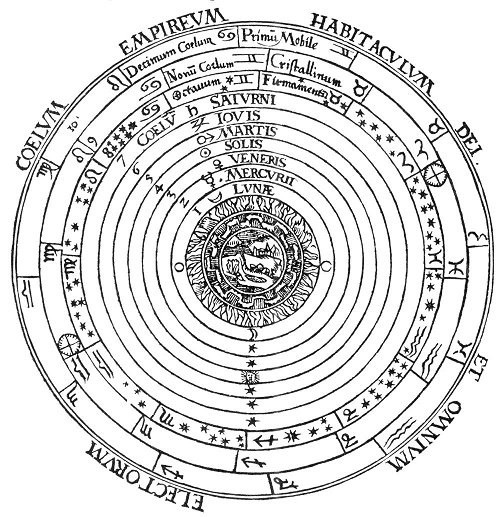 Ptolemy, building upon theories and ideas of astrologers and philosophers that had gone before him, devised a simple scheme regarding the structure of the universe. It became known as the Ptolemaic or Geocentric Universe. With the immovable earth at its centre all the planets and stars rotated around it in a series of concentric, circular crystalline spheres. They were embedded into the surface of the spheres like jewels. Outside the spheres was the dwelling place of the creator, divine and unknown. The first sphere is called the Primum Mobile. It had two very important functions. First of all it was responsible for maintaining the structure of the universe. It contained the other spheres within its boundary. Secondly, it was the motivating force behind the rotation of the other spheres, a sort of cosmic clockwork mechanism. Spheres two and three have the stars embedded in them. Number two contained the stars of the zodiac constellations. The next one down has the fixed stars. Moving inwards we have the seven planetary spheres that extend downwards from saturn to the moon. The order of these spheres from the outer to innermost is saturn, jupiter, mars, the sun, venus, mercury and the moon. This is known as the Chaldean Order and in traditional astrology it occurs time and time again. This order is worth remembing. Just as large, heavy objects appear to move more slowly when seen from a distance, this same observation was applied to the planets as viewed from earth. The chaldean order of the planets is a scheme thst reflects each planets distance from furthest away from earth to the closest. It also reflects the order of the heaviest to the lightest planet as well as their mean speed from the slowest to fastest. In this planetary scheme the sun is at the centre of the spheres dividing the planets into two groups. Above the sphere of the sun are mars, jupiter and saturn which are referred to as the superior planets. Below the sun are venus, mercury and the moon. Although venus and mercury are referred to as the inferior planets, the moon isn’t. In the great astrological tradition the sun and moon are known as the lights or luminaries. They are regarded differently from the five planets and called the greater and lesser light or respectively. However it is worth noting that the sun has three celestial bodies on either side. Immediately below the sphere of the moon comes the spheres of the four classical elements. First of all is fire, then air and the next is water. At the very centre is the elemental sphere of earth. This is the sphere upon which everything in the world is supported. But not everything was quite so straightforward in Ptolemy’s scheme. Although the planets normally travelled across the sky in regular, circular paths, sometimes they slowed down and stopped before moving backwards. This is called retrograde motion. After a while they stop again for a second time then started to move forwards once more, recommencing their previous direct motion. A planet that has completely stopped in the sky is said to be stationary or at station. Many ancient astronomers wondered why this happened. Ptolemy put forward the idea that as the planets were carried through the sky on their crystalline spheres, they simultaneously moved in tiny circles. This can be likened to a fairground ride. As it moves in a circular direction it has carriages fixed to it that spin round and round. He called these smaller circular orbits epicycles. But there were still some discrepancies in the heavenly movements that could not be accounted for by Ptolemy’s scheme. So he proposed that the earth was just ever so slightly off-centre of the middle of the universe. This would account for the deviations he observed. It meant that all the spheres would rotate in a slightly off-centre motion too, rather like wonky wheels. This belief in the Ptolemaic Universe persisted for many, many centuries before finally being superseded by the Heliocentric or sun-centred model of Copernicus.